When I was in my 20's, I had a skincare regimen, but It was mostly cleansing, toning, and moisturizing; you know, just the usual. I didn't have an eye care routine, well not until I got into my 30's. When you are In your 20's, you are not concerned with wrinkles, crow's feet, or dark circles. I added an eye care regimen the moment I turned 30, and I am in my early 30's with no wrinkles yet (crosses fingers), but I suffer from dark circles and occasional puffy under eyes when I don't get adequate sleep. Nyakio Quinoa Depuffing And Firming Eye Cream is part of my daily regimen. I use this eye cream in the morning and at night. Nyakio eye cream reverses the look of my dark circles and helps to depuff those pesky eyes bags. 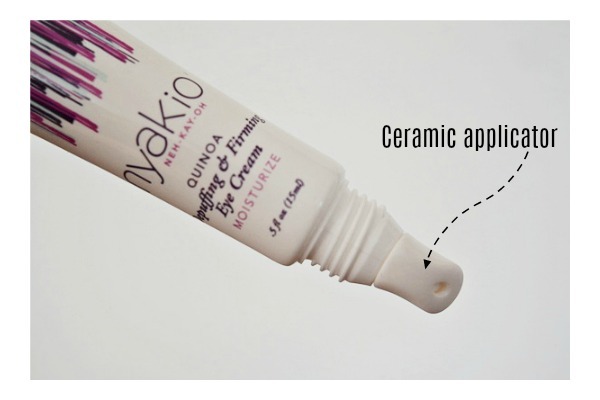 The active ingredients used in Nyakio eye cream is Quinoa. Quinoa is a 'super-food,' It is a grain crop that is grown for its edible seed. Quinoa is gluten-free and packed with protein and amino-acid. Quinoa also has a high amount of Vitamin E that helps to neutralize the free radicals on the skin. Free-radicals are the bad guys that promote premature aging on the skin. Quinoa can help to stimulate the skin to produce collagen over time, therefore using a skincare product that has quinoa will help firm and tighten your skin, leaving your skin looking younger and youthful. Quinoa helps to brighten and tone the skin because of its rich source of Vitamin B. Quinoa contains Tyrosinase inhibitors which are enzymes that decrease pigmentation, and therefore brighten the skin. As you can see, quinoa is a superior ingredient with excellent beauty benefits. I use the eye cream twice a day after cleansing and moisturizing, I squeeze a small amount and pat the product under my eye gently with a clean finger. After the product is absorbed into my skin, I use the ceramic applicator tip and massage my under eye for ten seconds. The applicator tip is always cool to the touch. Overall, I will give Nyakio eye cream 5 stars. ** I got sent this product for review purposes, all thoughts and opinions are my own. Do you use eye cream as a part of your beauty routine?